…and that’s enough of the Akira references, I should think. Though that film’s influences on this one are fairly obvious. Not that that’s a bad thing. Though Chronicle never gets quite as apocalyptic as it’s Asian forebear, the heightened teen angst makes it feel, in context, like it’s the end of the world. Alex Russell and Michael B. Jordan as the more level-headed (relatively speaking) of the trio, are charming and funny and just the right amount of obnoxious for the roles. But it’s babyfaced Dane DeHaan as the very troubled Andrew that’s the real standout here for me. I completely bought into him as the shy, reserved wallflower with the abusive homelife that allows his resentment and anger to boil over into telekinetic villainy. The tragedy isn’t that he becomes “evil,” because I don’t believe that’s what happens. The tragedy is that you can see it coming from the very beginning and notice a half-dozen places, even at the very end, where it could possibly have been pulled back from the edge. DeHaan reminded me many times of a younger, darker Leonardo DiCaprio. I’ll definitely be checking him out in future projects. The two biggest surprises for me in this film were 1) the special effects, which given the $15M budget are pretty damned amazing (in particular the flying sequences, including one very close call with a commercial jetliner), and 2) the “found footage” format was not nearly as annoying (or nausea-inducing) as it could have been. Now don’t get me wrong, I think this film would have benefitted from significantly LESS shaky cam (the bane of my goddamn existence), but for all of its use here there was only one moment where I felt it necessary to actually look away from the screen to avoid spewing popcorn all over the row in front of me. So if you HAVE to have shaky cam, I guess that could be put in the win column. 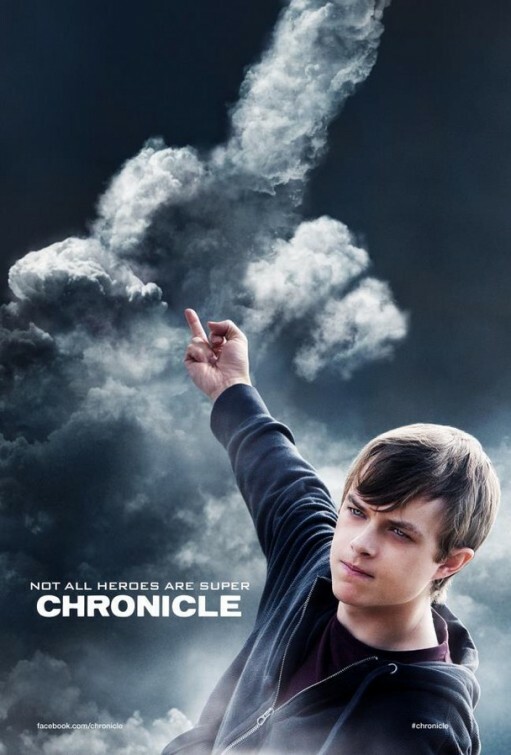 Chronicle manages two feats of cinematic superheroics: it takes a comic book origin story and sets it in the “real world” believably; and it finally finds a safe and sane balance of found footage shaky cam cinematography with clear and concise visual storytelling. Now, Hollywood, with that out of the way may we please never see either of those two tropes again? This entry was posted in Movie Reviews and tagged akira, alex russell, chronicle, dane dehaan, found footage, josh trank, kaneda, max landis, michael b jordan, movie, seattle, shaky cam, superheroes, telekinesis, tetsuo. Bookmark the permalink. Very nice review. Haven’t read your reviews before unless I am repressing a New Moon review?! It was very informative and not too long. I didn’t get some of the references, but it did not make your review ineffective. Thanks! May have to check this one out.